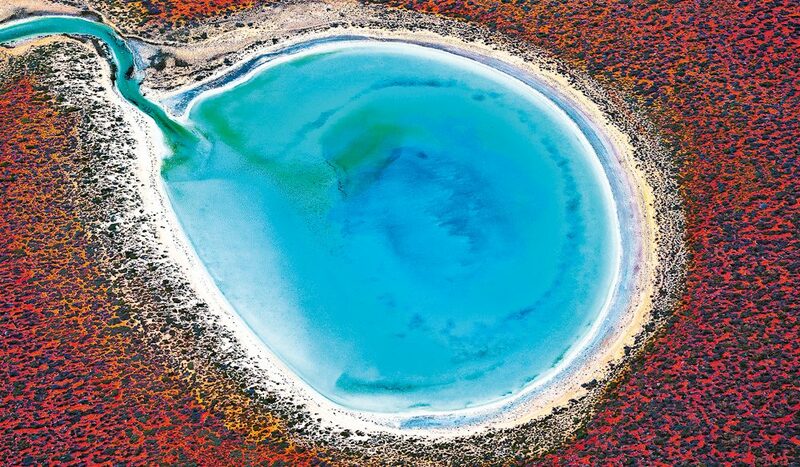 Big colours: Little Lagoon, Shark Bay, WA (photo: Tony Hewitt). This natural wonder on Western Australia’s Coral Coast, a stone’s throw from marine wonderlands Ningaloo Reef and Monkey Mia, is more than just a pretty sight: it was once a land-locked saltpan that was inundated by the sea thousands of years ago, creating an unspoiled body of water that is now home to an endless array of fish species. More incredible is its location – in the Shark Bay region, just four kilometres from the town of Denham. Can you imagine this being your town’s local swimming hole? Those lucky Denham folk can easily drive down for an afternoon swim (or take the two-hour Lagoon Point trail walk). But award-winning photographer Tony Hewitt says seeing this wonder from the air “reveals a kaleidoscope of colour and texture, shape and form. The ebb and flow of translucent waters, which wind their way through rich red sandscapes, pearlescent shell beaches and hidden lagoons, invite my inquisitive eye to join them on their timeless wanderings”. The article is nice, but the photo isn’t the Little Lagoon – A subsidiary Lagoon of the Big Lagoon, I believe.